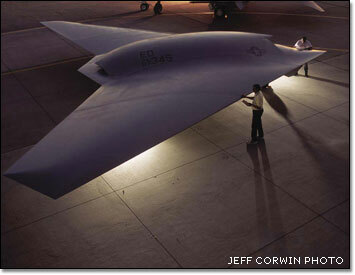 Boeing�s family of unmanned aerial vehicles is being designed to satisfy the needs of a multi-billion dollar market. So goes the family, so goes the business. That�s Boeing�s approach to the burgeoning UAV market; to offer a �family� of unmanned, net-enabled systems that employ the best possible capabilities from across the company and strategic partners. Boeing�s goal: Have its customers view the company as a solutions provider for every enduring need. aircraft that combines the speed and range of a jet-powered fixed-wing aircraft with the flexibility of rotary-wing flight. The vehicle’s rotor is designed not only to spin and provide lift during vertical takeoffs and landings but also to stop turning during flight, lock in place laterally, and function as a wing for high-speed cruise. The Dragonfly demonstrator, also known as the X-50A, is propelled by a conventional turbofan engine combined with a unique Boeing reaction drive rotor system. During rotary-wing flight the engine powers the rotor system using thrust ducted to nozzles near the rotor tips. During conversion, a canard wing and horizontal tail provide the lift necessary to remain aloft until the rotor blade stops and functions as a fixed wing. Engine power is redirected aft to provide forward thrust. The aircraft requires no gearbox, transmission or tail rotor. The vehicle is 17.7 feet (5.4 meters) long, 6.5 feet (2 meters) high and weighs 1,480 pounds (662 kilograms). 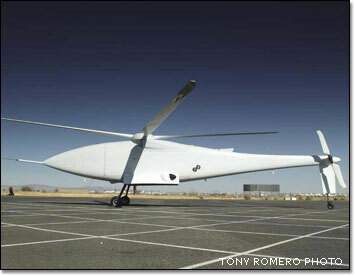 The first CR/W technology demonstrator completed two successful hovering flight tests in late 2003, for 20 and 80 seconds at 12 to 14 feet (3.7 to 4.3 meters) above the ground. The second demonstrator began ground checkout tests in April and is scheduled to begin flight testing soon. 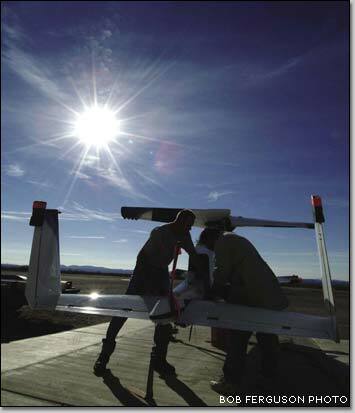 Enhanced Canard Rotor/Wing platforms are projected to be available for service in the 2012 timeframe. The Boeing family of UAVs under development includes fast, lethal, highly sophisticated integrated systems built specifically for combat, like the X-45C Joint Unmanned Combat Air Vehicle; long-endurance, surveillance and reconnaissance systems like the A160 Hummingbird; and small tactical UAVs produced with partners, such as the ScanEagle. And even if these UAVs differ in size, design, missions or unique technologies, Boeing is working to link them through common mission-management software that lets them operate effectively in the same network. That�s a key component of the Boeing approach to UAVs, says Kim Michel, Boeing Phantom Works director of Advanced Unmanned Systems. Such an approach is attractive to the U.S. Department of Defense because of its applications to network-centric operations and joint operations between services and with allied coalition forces, Michel says. The UAV market is growing, and so is Boeing�s presence in it, Michel says. Four years ago, U.S. government spending on UAVs was in the range of $200 million to $300 million a year. Now, that�s up to several billion dollars annually. UAVs, including the Boeing ScanEagle, have been deployed and used successfully in U.S. combat operations in Iraq and Afghanistan. �It�s really caught the eye of the Department of Defense and they�re finding that the more they use these kinds of systems, the more uses they find for them,� Michel says. Phantom Works is doing most of the heavy lifting in early development of Boeing UAVs. After reaching a certain point in their development, these programs are transitioned to Boeing Integrated Defense Systems. The X-45 became part of IDS in January 2004. Summaries of each of these programs appear over the next few pages. • An X-45A demonstrator in April 2004 hit a ground target with a 250-pound inert near-precision-guided weapon released from its internal weapons bay. • By flying two X-45As together in August 2004, the program demonstrated multi-vehicle operations. • In February, the X-45A conducted its first simulated combat mission. While the X-45A undergoes flight testing, Boeing Integrated Defense Systems is developing an advanced, larger version, the X-45C, for an early capabilities demonstration. The C configuration will be approximately 39 feet long with a 49-foot wingspan (11.9 meters and 14.9 meters, respectively), and cruise at 0.80 Mach. The first X-45C will be completed in 2006 and flown in a U.S. government operational assessment beginning in 2007. The ScanEagle is a low-cost, long-endurance autonomous UAV developed by Boeing Phantom Works and The Insitu Group of Bingen, Wash. ScanEagle is based on Insitu�s miniature robotic aircraft and draws on Boeing systems integration, communications and payload technologies. Boeing foresees customers using ScanEagle vehicles to loiter over trouble spots and provide intelligence, surveillance and reconnaissance (ISR), or function as a communications relay platform. Since being deployed in Iraq last summer, ScanEagle has surpassed 2,800 flight hours during operational missions. The U.S. Marines have relied heavily on the system and its long-endurance capability, ISR value and ability to operate in harsh weather. 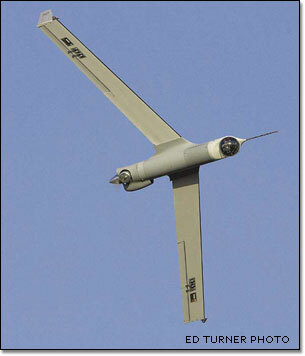 Capable of flying above 16,000 feet (4,880 meters), the ScanEagle has also shown the ability to provide persistent low-altitude reconnaissance. Boeing received a $14.5 million contract from the U.S. Navy in April to provide UAVs for Naval Expeditionary Strike Group and oil platform security in the Persian Gulf. and reconnaissance. It can also be configured to carry a variety of payloads and to launch weapons in combat. This range of missions sets it apart from other UAVs. Boeing Phantom Works program manager for the Unmanned Little Bird. ULB flight tests, with a safety pilot in the cockpit, began last fall at Mesa, Ariz. By April, the single flight-test vehicle had accumulated more than 150 hours of flight. Later this year, the ULB will begin unmanned flight tests. The ULB team includes Boeing and L-3 Communications. The A160 Hummingbird UAV looks like a helicopter but is unlike any other helicopter. 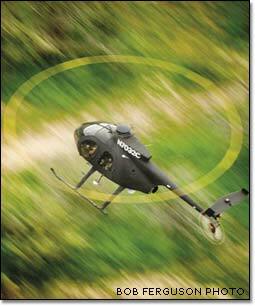 It can reach higher altitudes, hover for longer periods of time, go greater distances and operate much more quietly than current rotorcraft. With its unique optimum-speed rotor technology, the Hummingbird adjusts rotor RPM to optimize performance at different altitudes and cruise speeds. The aircraft addresses current and emerging requirements of the U.S. armed forces, the U.S. Department of Homeland Security, and international military and security organizations. Missions for the A160 include reconnaissance, surveillance, target acquisition, communications relay and precision resupply. A Phantom Works IDeAS team called Advanced Unmanned Systems�Concept Exploration is developing the A160 with the government. The Hummingbird is designed to fly 2,500 nautical miles (4,630 kilometers) with endurance in excess of 24 hours and a payload of more than 300 pounds (136 kilograms). It is intended to fly at an estimated top speed of 140 knots (259 kilometers per hour) at ceilings above 15,000 feet (9,100 meters). Through mid-April 2005, three A160s had completed 27 test flights for 34 hours of flight time.